I’ve been following the gestational diabetes diet for just about a week now, and so far, things seem to be going great. I know one of my biggest fears was being hungry all the time, but with the regularly scheduled snacks, I’m hungry a lot less than I was before the diagnosis, even if I have lost a pound or two because the choices are so much healthier than some of the choices I was making before my diagnosis (goodbye handfuls of chocolate chips…). I’m going to talk a bit about my diet and what I’m eating, but please note that this is not advice for folks with GD. This is what my doctor and dietician prescribed for my specific situation. Seek the help/counsel of your medical professional if you are suffering from the condition. Since I get up really early (usually between 4 a.m. – 5:15 a.m.), my dietician allowed me to follow pretty much the same schedule I had already been in regard to morning meals. I eat something about a half hour after getting up, work out, and then get to eat a second small breakfast about two and a half hours after the first. Right now, I’m loving Arnold Whole Wheat Sandwich flats with either two tablespoons of natural peanut butter or the sandwich flats with two tablespoons of soft goat cheese (pasteurized!) and a quarter to half cup of berries. I usually have one earlier and the other later. And if I sleep in, instead of eating two breakfasts, I just eat the one. I’ve also added an occasional decaf coffee with half and half — glorious! I have a snack around 10:30, and was advised to mix a protein and a carbohydrate for all snacks/meals. I’ve typically been eating a small red delicious apple with a piece of string cheese. If I’m really hungry (we did a lot of yard work this weekend, and I was), I add a hard boiled egg (organic, from our chickens) to the mix. I’ll include a great way to hard boil fresh eggs later this week! Lunches tend to vary, but I usually eat salad – two cups of greens and about a half cup of other mixed veggies (cucumbers, peppers, tomatoes). I add to that a half serving (sometimes a whole) of carbs in the form of organic, whole wheat croutons (Olivia’s from my home state of Vermont are my favorite and so close to homemade without the temptation of snacking on them while they’re baking), a full serving of carbs as fruit (sometimes one and a half), and usually a serving of carbs in the form of dark chocolate – lately I’m choosing Green & Black’s Mayan Gold. At times, I’ll substitute in bread or leftover rice or grains, but getting a legitimate chocolate fix in the middle of the day helps me feel less deprived and has kept me from even thinking about cheating. I top the salad with either a hard boiled egg or three to four ounces of grilled, organic chicken to add some protein. My afternoon snack varies between a few favorites. Right now, I’m loving three graham cracker squares smeared with a thin layer of peanut butter. If I’m in a pinch or on the go, I resort back to the apple and cheese. If it’s super warm, or I’m not feeling very hungry, I throw three quarters of a cup of 1% milk in a blender with half a cup of frozen blueberries and a tablespoon of flax seeds. There are TONS of other options, but these have kept me pretty happy so far. I also just read about Peanut Butter & Dark Chocolate Kind +Protein bars, which I’m thinking about picking up tomorrow for those days when I’m on the road and can’t grab an easy snack (16g carbs per bar – 1 serving). We’ll see how they do! Dinners are pretty standard. I can still eat almost everything we were eating before, but I just have to watch my carb serving sizes. Honestly, though, sometimes it’s hard to get enough of them. I’m thankful for the Eating Well cookbooks I’ve accumulated over the years because they have TONS of great and interesting recipes. I’m also scouring the internet for new things to do with some of our favorite old veggies to spice things up a little because lean proteins get a little dull after a while when I have to incorporate so many of them throughout the day! After dinner, we take Abby for a nice, long walk – a new ritual that I’m finding really soothing (and great for my blood sugar levels!). I’ve tried a few bedtime snacks (a must with GD), but the only one that I’ve found consistently keeps my morning, fasting blood test around 80 is a half cup of fat free, plain Chobani Greek Yogurt with a half cup of berries and a quarter cup of nuts. I haven’t really had a problem with other bedtime snacks and my fasting sugar test, but this one is satisfying and on hot nights, I make it at dinner time and throw it in the freezer for something that tastes a little more like ice cream. The only rule I have for evenings is that I’m not allowed to do simple sugars – so no ice cream or chocolate or other quick fixes. But, really, everything else is still on the table in small portions. If you’re dealing with GD, what are some of your favorite snacks and meals? When we found out we were pregnant, one of the first things I knew was that I wanted a mural of some kind in the nursery. Something soft and calming, and – most importantly – something I could do myself. 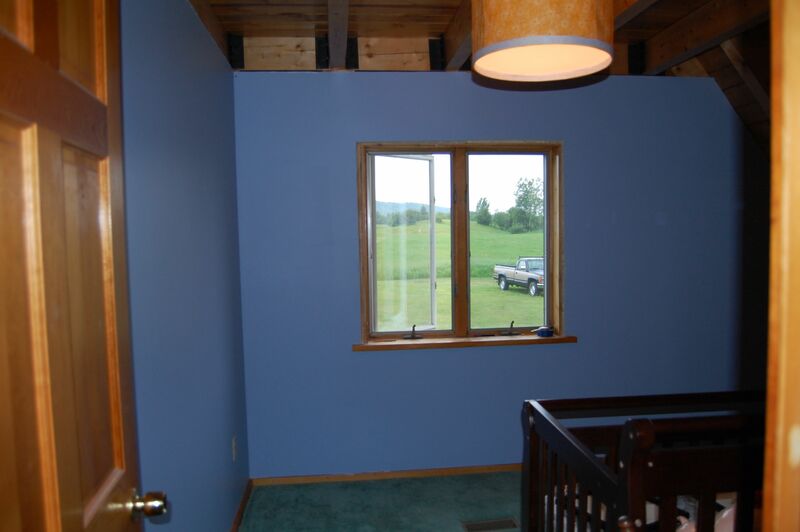 Given that the carpeting in the room is green and still in great condition, warm blue walls and a tree seemed like a reasonable choice (even before we knew we were having a girl). That said, once we knew our little one was a girl, I wanted something a little more floral, particularly since the nursery prints we chose focused around gender neutral images of animals native to our area: foxes and skunks and squirrels. I’ll have a more complete nursery post up once we hang the curtains later today, but I thought starting with the tree would be a good idea. 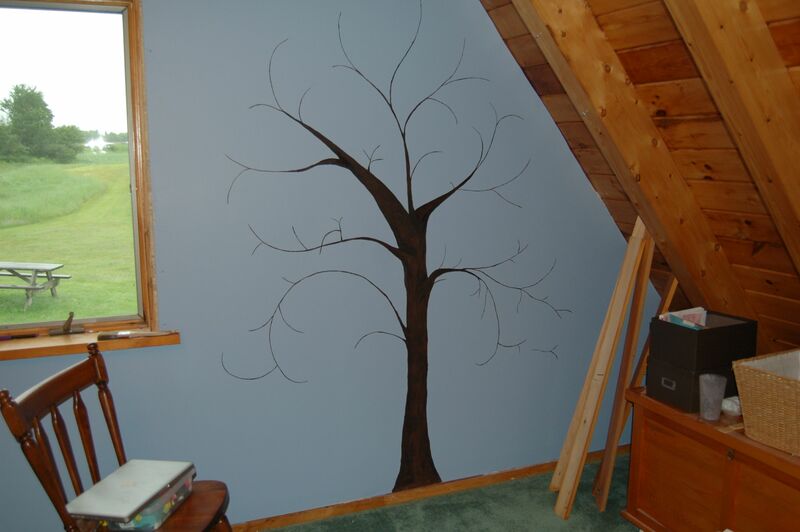 Now, in order to paint the tree where I wanted it, Jason and his dad had to do quite a bit of work preparing the room and sheet-rocking the north wall, which I hoped would make the room cozier and more complete. 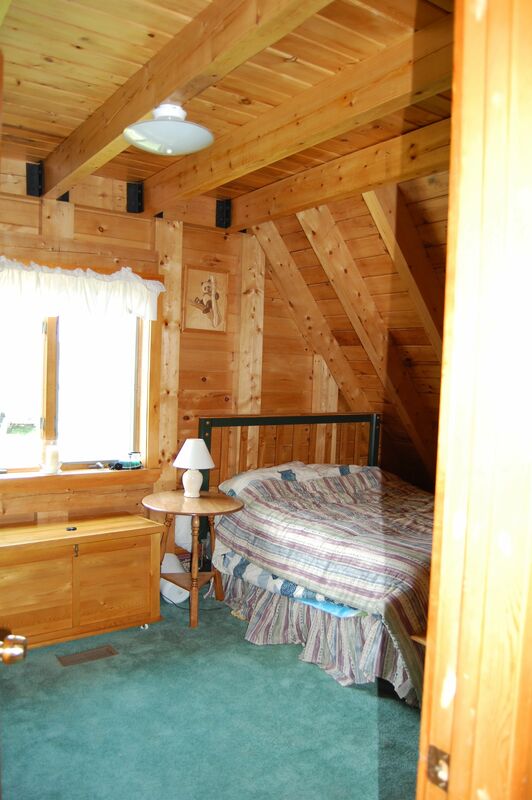 The former guest room, when we were using it as a guest room. It took about one day for Jason and his dad to install the sheet rock, and during that time, his mom put down a coat of primer over the existing teal-green paint. We decided to paint the room with Benjamin Moore’s Riviera Azure 822, which has soft lavender undertones, particularly in the late afternoon. While I had thought about buying their Aura paint, we went with the Regal Select Interior paint in eggshell and were perfectly happy with its coverage and low VOC status. My doctor had already nixed my helping with the painting, anyway, so it wasn’t as though I was being exposed. I was surprised how little the paint smelled (they did keep the windows open) and how quickly any remaining smell dissipated. 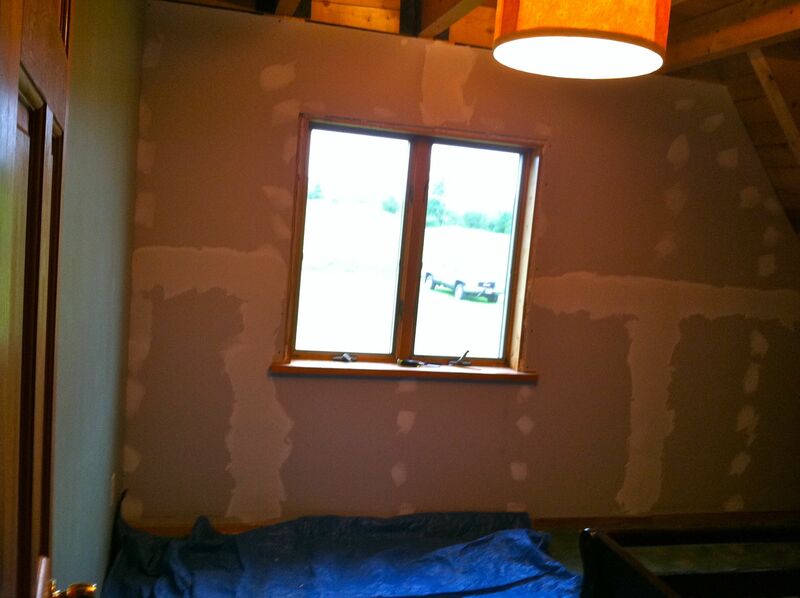 It took almost a week for the sheet rock mud to dry and be sanded away properly before Jason and his mom could complete a second coat of primer and paint the room (they did two coats, just to be sure of coverage). Once the paint dried, I started working on the tree. Now, I’d looked at TONS of trees (you can see evidence of this over on my Pinterest site), but I’d fallen in love with the “Tree of Life” print from Ruth Baker. The problem was that with humidity fluctuations here in the summer and winter, I didn’t want to be constantly replacing bits and pieces of a tree on the north wall of my nursery. Add in toddler hands that might want to peel it off, and I knew I had to paint it, myself. 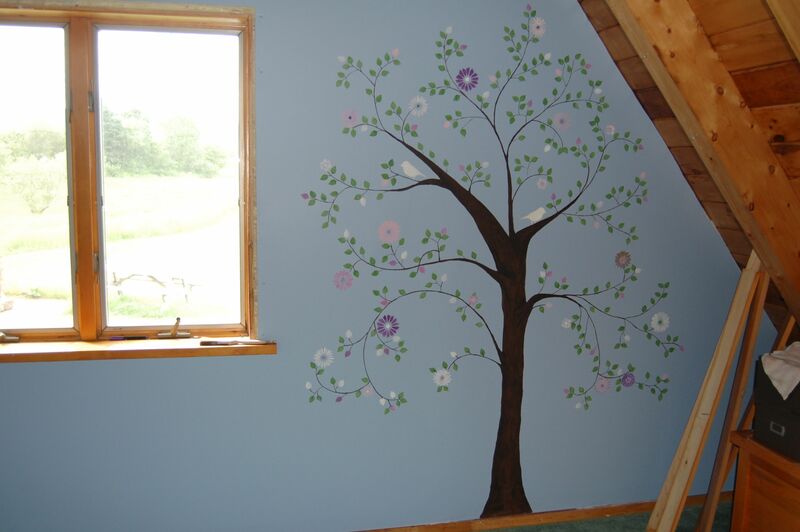 In addition to this, there were parts of the design that didn’t really fit with my image of the nursery. I didn’t love the roots at the bottom, the birds were a bit cartoonish for my taste , and the colors didn’t quite match our palette. So I got to work on creating my own using a few simple tools. I purchased a Bohin Mechanical Chalk Pencil from Amazon, knowing that I needed it for a quilting project I was already working on. This tool was invaluable, as it allowed me to sketch my tree trunk before I painted it; and as soon as I was done and the paint was dry, the chalk came right off with a dry rag. I also purchased two stencils, one of birch leavesand another of flowers. You could freehand these if you wanted, but I found a stencil much easier to use. I started by sketching my tree in chalk on the north wall of the bedroom. I know it’s difficult to see, but there is a tree sketched here. 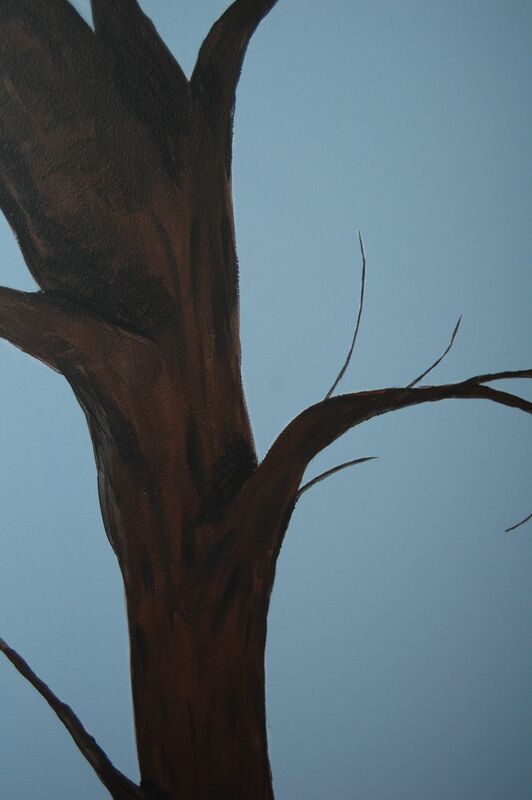 Using simple, matte acrylic paints from Walmart and Michaels, I created a base coat on the entire tree and then mixed in some black and started shading around the edges to give the tree some depth using a few paint brushes that we’d picked up at a craft store. This process took an afternoon. Notice that I didn’t add every little branch. 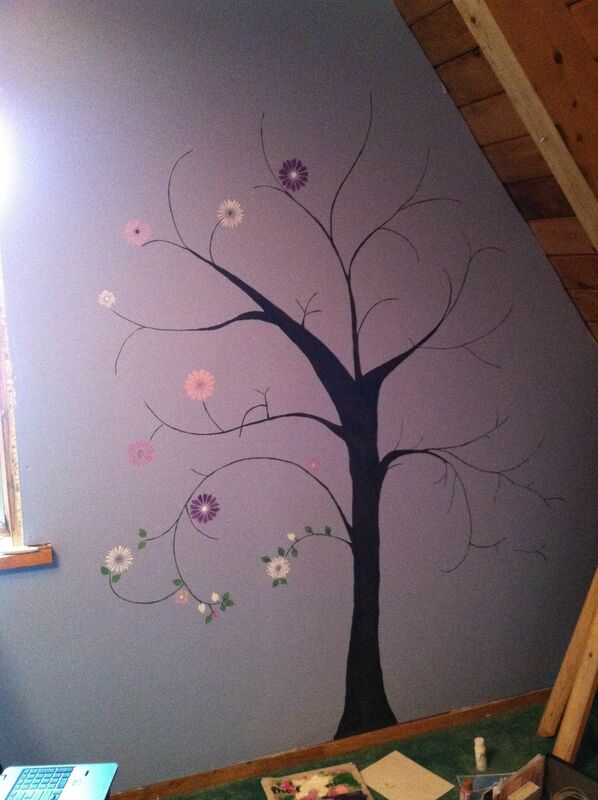 I painted most of the smaller bits in after I started stenciling on the leaves and flowers. The problem I encountered stenciling (using a variety of small stencil brushes) was that I was trying to do WAY too much at once. I had all of my lighter flower colors out; I was trying to switch back and forth between flowers and leaves, and I was up and down over and over again, which is not so much fun at 26 weeks pregnant. So I quickly changed tactics and painted all the leaves, followed by all of the flowers, which gave me better control over where colors were being distributed. After two days of work, I was left with a floral tree that matched the other colors in the nursery and completely fulfilled my vision. 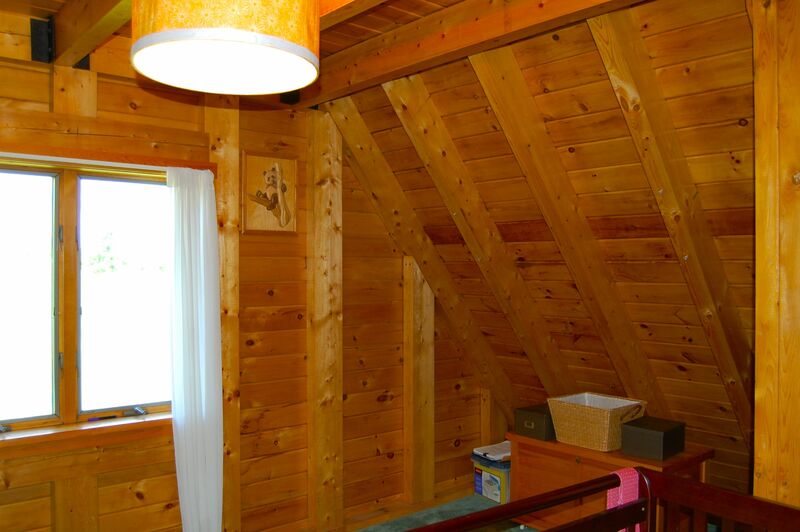 Coming soon… adding the trim to frame and finish the room! I went into Monday and Tuesday’s appointments with the Diabetes Educator and dietician well prepared but very nervous. The internet is great for some things, but more often than not, medical information on the internet just makes me feel more anxious. And what I found, even among my own friends is that plenty of people had had GD and just never mentioned it until I brought up my own fears and concerns, which makes me wonder how much of that silence is shame that we’ve somehow done this to ourselves and our babies, even though both the educator & dietician reassured me that it had nothing to do with my previous diet, it was just how my body was reacting to the stress the pregnancy was placing on it. Now on day three of testing my sugars, I’ve realized that my numbers tend to hang out in the lower side of normal. I haven’t even come close to hitting the GD two hour post meal max of 120 (it’s different than regular diabetes, for those who might be concerned), and my morning numbers hit right between 70 – 90 (again, GD specific goals). So having watched my body respond to the sugars I’m feeding it made me feel so much better about how things must have been going prior to my diagnosis since my diet really hasn’t changed that much. I’m not saying it’s all easy. For the first day or two, I developed a real fear about my inability to control things, though we had dinner out last night, and my numbers were still fine afterwards, so I’m starting to trust the flexibility of the diet (and moments when I can’t track the exact number of carbs on My Fitness Pal). In addition to that, the dietician actually has me eating more regularly now than I was before (every 2 – 3 hours), and, if anything, I have been more full and satisfied than I was before the diagnosis. The best part is that, so far – for me – nothing is off limits. I can have a cupcake (or half of one if it’s a monster), but it means limiting other carbs at that meal and not eating it as my bedtime snack. And dark chocolate is still totally on the table, especially at lunch where my salad eating habits have me struggling to meet the carb allotment I’ve been given. Honestly, buying two Green & Black bars to chop into smaller serving sizes was the highlight of my week! So what has been helpful so far? I am loving My Fitness Pal, which I’ve always used in the past (pre-pregnancy) for diet management when I’m worried about my eating habits slipping a bit. I also ordered a kitchen scale from Amazon to help out with tough portions like fruit (when was the last time you tried to measure a 1/2 cup of raspberries?). In addition to that, I treated myself to two ASOS maternity dresses that are on sale until tomorrow with a great 20% off coupon (HAPPYFOURTH as you’re checking out). Though I’ve never ordered from them before, the company offers free shipping, and since we’re planning a little getaway next weekend, I saved enough money to upgrade to free, expedited shipping. So what’s coming in the mail? And this sweet little dress in navy, that I think will be a bit longer on my frame (I’m not the model’s 5’11’) and be great for running errands or teaching (pending length). I’ll let you know how the sizing runs. Since I tend to sit between dress sizes, I ordered the larger size, just because I want them to last through the end of the third trimester (which started yesterday! ), as once school starts again, I’m going to have to give up my uniform of athletic shorts and maternity tank tops. When my doctor handed me the lab slip for the one hour Glucose Tolerance Test (GTT) two weeks ago, I barely thought about it. I listened to my nurse’s advice about what to eat the morning before (peanut butter toast – something with a good mix of carbs and protein) and headed out of the office. My risk factors were minimal: I wasn’t overweight before I got pregnant, I exercise regularly (even after having to take a few weeks off early on because of morning sickness), and I eat a healthy diet, though I am over thirty and both of my grandmothers developed Type 2 Diabetes later in life. I followed up with the blood screening on a Monday morning, following a meeting at work, and was, perhaps, a bit too surprised when I called the office Wednesday to find out that I’d failed the GTT. And not a little fail… a big fail (191) that would jump me right past the three hour exam and into the capable hands of the hospital’s diabetes educator and dietician. I’ll admit that I went through several of the stages of grief… focusing mainly on anger. I eat healthily. I can’t tell you the last time I had a soda or much more than a jellybean or two of processed candy, but I did go a little overboard with this year’s birthday cake… But more than anything, I felt guilty. I had continued eating whole, natural foods during this pregnancy, but I’d slipped a little, snacking on a few of Jason’s chips as I packed his lunch in the morning and indulging in a handful of chocolate chips occasionally in the afternoon between lunch and dinner. I go for my appointment with the diabetes educator tomorrow morning, and I think, for a while, at least, I might be talking about gestational diabetes quite a bit here because it’s hard to find an outlet. I am in no way a doctor or medical professional, but sometimes I think following other people’s experiences can help us work out what we’re going through almost as much as writing about them, so I’m hoping to post some of my experiences and recipes. I will note that the baby looks great so far, and I’m hopeful that we can manage this with diet and exercise (especially since our garden is finally starting to come in!). And on a second positive note, my husband and his father finished hanging trim in the nursery this weekend, so I should have an update with photos for you soon! Thanks for reading! If you have had experiences with GD, I would love to hear about them!